Leonard Nimoy, the actor who played Spock on the 1960's television show Star Trek, died on Friday, February 27, 2015. My friend, Darlene Parsons, one of the collaborators of the website Wartburg Watch, came to faith in Christ while watching an episode of Star Trek. Though Darlene's testimony is unusual, God often demonstrates an ability to speak to people through various and unusual ways. The Vulcan greeting of Spock may be one of those unusual ways. In a video for the Yiddish Book Center's Oral History Project, Leonard Nimoy describes how as a boy in the Jewish synagogue, he first saw the hand symbol that he later adopted as the Vulcan greeting (see above left). The Jewish hand signal he observed was five fingers forming the Hebrew letter Shin. 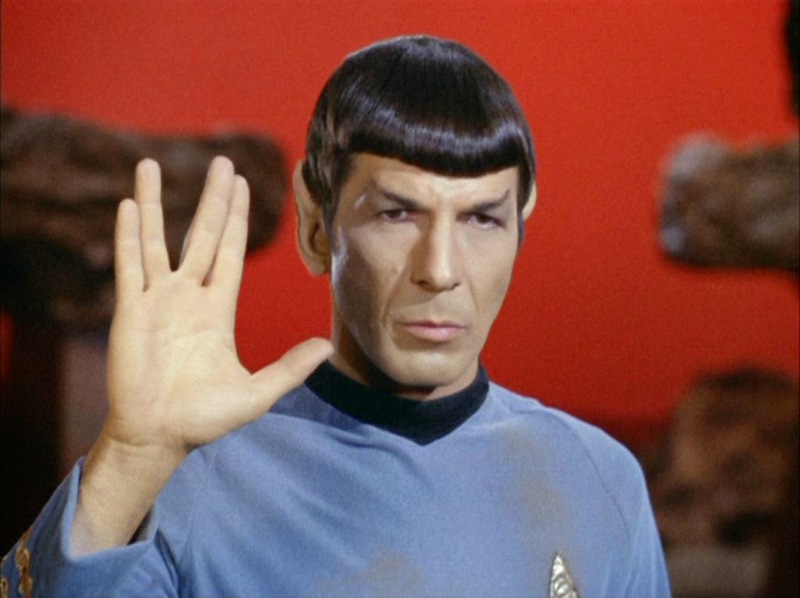 Years later, Spock suggested to the director of Star Trek that this hand signal be adopted as the Vulcan greeting along with the phrase "Live long and prosper." I'd like to demonstrate in this post how this hand signal, one that most Americans simply know as a fictitious Vulcan greeting from a 1960's television show, might actually be a great substitute for the traditional American handshake. "Your gift of the pearl must be guarded from thieves who may harm you, but my gift is even more valuable because it guards us from harm!" One of the Hebrew words for God is Shaddai שדי, which means "Almighty." The Hebrew letter Shin ש is the first letter of Shaddai (read Hebrew from right to left). Thus, when the Jews left or entered their homes, they professed their belief in Almighty God (El Shaddai), the One who gives them life and prosperity in the face of all their enemies. The Shin represented to the Jews the power of their God. Orthodox Jews will never pronounce the Hebrew personal name for God (YHWH) which is translated in our English Bibles as LORD (all capitals) and transliterated into English as Jehovah because they believe 'The Name' too holy and sacred. Refusing to pronounce "The Name" for God, the Jews have for centuries assigned the Hebrew letter Shin as an abbreviation for "The Name" of God. The Hebrew word השם means "The Name" and notice how the Hebrew letter Shin ש is in the middle of "The Name." It is for this reason the letter Shin, which in Hebrew also pictorially represents the 'fire' or 'presence' of God, came to represent "The Name" of God (see Leviticus 24:16). 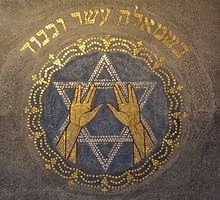 I'm sure it will be surprising to many Americans that what they've known as the Vulcan greeting given by Spock on the television show Star Trek is actually the Jewish hand signal for "The Name" of God and represents the belief that God alone provides life, provision and security for His people. In II Chronicles 6:6 the Lord says: "I have chosen Jerusalem, that My name may be there, and I have chosen David to be over My people Israel." 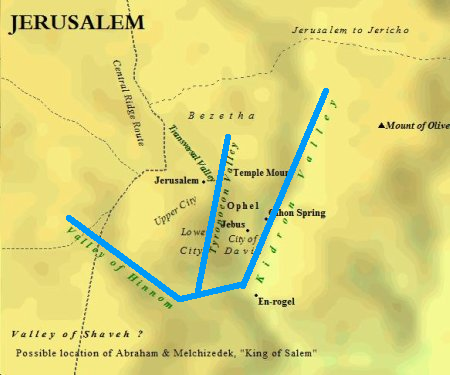 Some Jews do not believe it to be coincidence that the city of Jerusalem has not only "The Name" in the middle of the Hebrew word for Jerusalem (see picture to the left), but the city itself is built on top of three valleys - the valley of Hinnom, the valley of Tyropoeon, and valley of Kidron (see picture to the right) - and these three valleys form the letter Shin. It can be safely assumed that God is in the business of leaving His mark in the city of Jerusalem. It was in Jerusalem that the Temple (the Presence of God) was built. It was in this great city of the world that God revealed Himself to man. All Jewish synagogues must have an ark of scrolls that face the city of Jerusalem. According to the Mishna and the Shulchan Aruch, Jewish daily prayers must be made facing the city of Jerusalem and the Temple Mount, where God has inscribed His name. Jews would place Mizrach plaques on the walls facing Jerusalem to always remind them of the direction to which their Jewish prayers should be offered, a custom later adopted by Muhammad's followers they began praying toward Mecca. 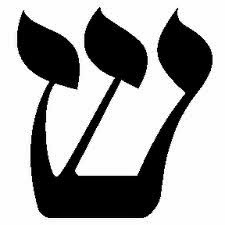 But the most astonishing thing about "The Name" of God as represented in the Jewish letter Shin is that it is prominent in the Hebrew name Yeshua. 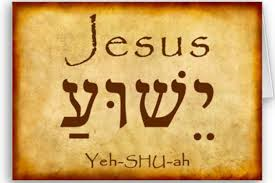 In English, Yeshua is translated Jesus. He is Emmanuel; God with us. The Name of God is seen in His Name. The Bible tells us Jesus' name was given to Mary by the angels because "He shall save His people from their sins" (Matthew 1:21). The Savior's name “Y’shua" is the exact Hebrew word for “salvation.” The Infinite became an infant to bring us salvation. Every time someone called out the name Y'shua, they were actually saying “salvation.” If someone asks, "From what does Y'shua save us?" the answer would be "shame." The shame of our sin and its judgment. There's too little time to show the incredible connection between the letter Shin in the Hebrew words "shame," "salvation" and "His name," but just know that God saves you from your shame for the glory of His name. In a city where God inscribed His name in the hills and valleys, a place where He dwelt among men in that first tabernacle, then later the Temple, and ultimately in the God-Man, Jesus Christ, who "tabernacled among men,' we find the incredible true story of One who gave Himself as atonement for our sins in order that we might come to know what it means to have eternal life, real prosperity and Divine security. So next time you think of Spock's "Live long and prosper" greeting, remember the Hebrew letter Shin and that it represents the grace of God in Jesus Christ. WOW! That's amazing! No, our GOD is amazing! Thanks a lot. 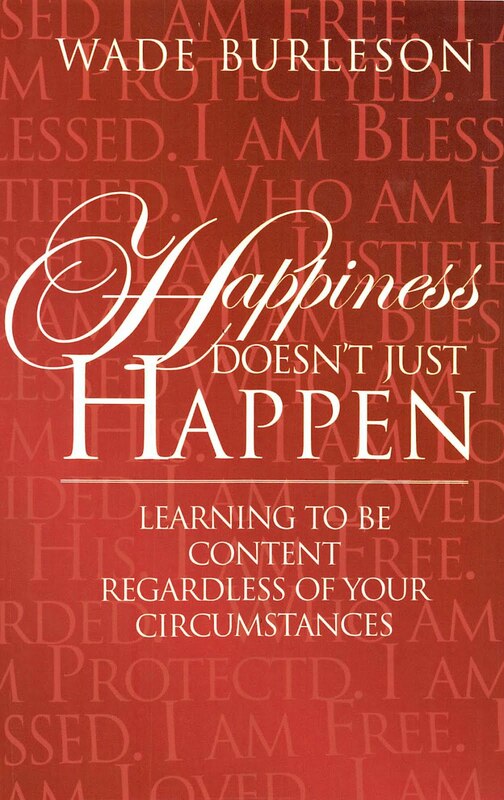 With your ‘advanced’ :) permission I put it on our church bulletin board. I copy pasted Spock’s picture showing his hand signal next to the “Hebrew letter Shin”. My only problem is trying to make my little finger fit the picture. I really enjoyed this post. 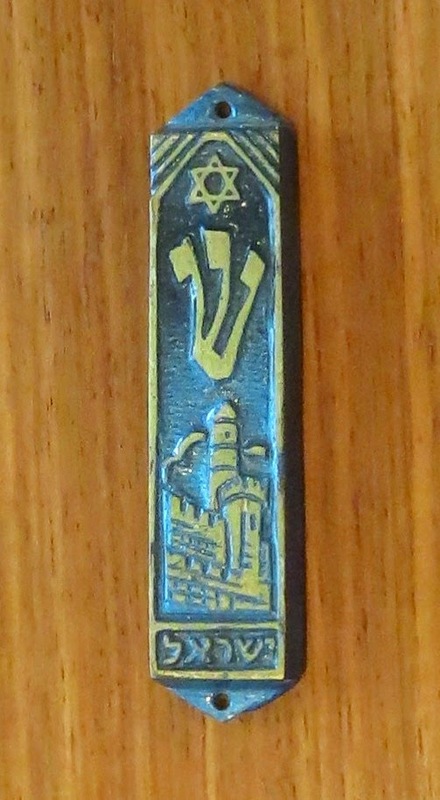 It is interesting that the 'blessing' of the Mezuzah is "The Lord is with us" and that the early Christians greeting each other with the words 'May the Lord be with you' and the reply was 'And also with you'. These words are still prayed today in my Church when the celebrant greets the congregation with 'May the Lord be with you', and we reply 'And also with you'. 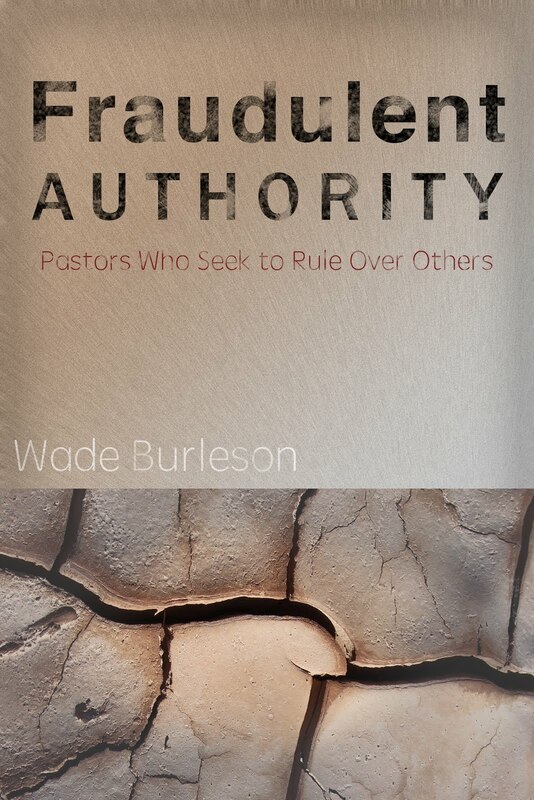 so this ancient blessing has endured and continues in Christian prayer even today. That was the standard greeting of the early church. Whenever two Christians would meet they would remember the glorious fact that Jesus rose from the dead, that He proved that He was who he said He was, that He had authority in heaven and on Earth, that He had authority over death, hell and the grave. Whenever they would meet, one would greet the other with "He is risen!" and the other would respond, "He is risen indeed!" I think you meant YHWH instead of YWHW (typo, I suppose). Could the Father, Son, and Holy Spirit be also represented by this Hebrew Letter? This has nothing to do with this post but I wanted your feedback. Have you ever taught anything about conspicuous consumption? Its not a new term but it is something new to me. Is it a sin? Why would it be wrong? 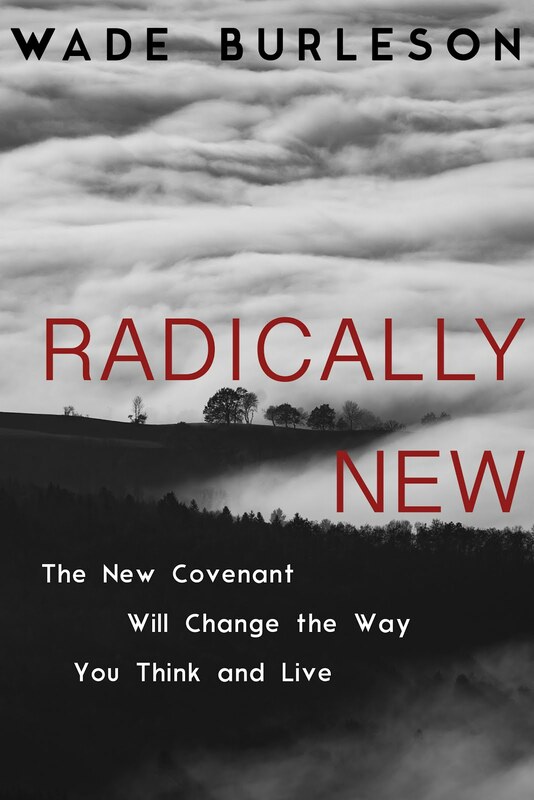 It was not a topic talked about much growing up in a Baptist Church but the concept was noticed. Have you written anything about it? Wikipedia: “Conspicuous consumption is the spending of money on and the acquiring of luxury goods and services to publicly display economic power—either the buyer's income or the buyer's accumulated wealth. Sociologically, to the conspicuous consumer, such a public display of discretionary economic power is a means either of attaining or of maintaining a given social status. Fred, I didn’t know what you were asking, so I looked it up. A long time ago, on a mission trip to Mexico, our church gave our old choir robes to a local church that was having a revival. Loud talking outside was disrupting the preaching. I scolded people that were fussing over choir robes in our van. I believe “invidious consumption” was their problem.